Product prices and availability are accurate as of 2019-04-20 22:40:12 UTC and are subject to change. Any price and availability information displayed on http://www.amazon.com/ at the time of purchase will apply to the purchase of this product. The Cavaliere-Euro 36W in. Tempered Glass Canopy Wall Mounted Range Hood pairs gleaming glass with stainless steel for a sleek way to keep your kitchen air clean. 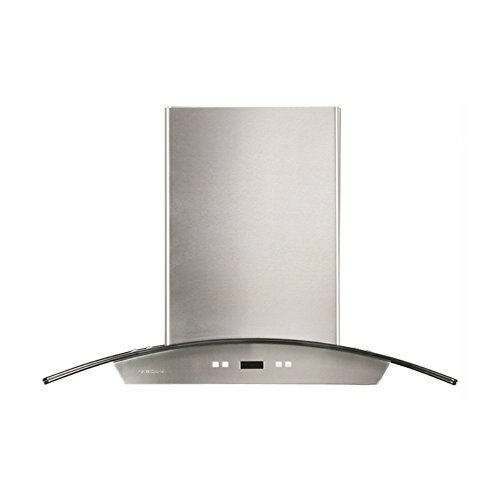 This wall-mounted range hood has contemporary lines crafted of 19-gauge brushed stainless steel with a curved, tempered glass top. A stunning beauty that's as stylish as it is efficient, this range hood offers a quiet, double chamber motor that quickly clears the air. Six speeds, a dishwasher-safe mesh filter, and two dimmable, 35-watt halogen lights add practicality. The touch sensitive keypad with blue lights ensures it's easy to use. Additional Information: 6 speeds with timer function Touch sensitive LCD keypad with blue lighting Dishwasher-safe filters Airflow: 900 CFM 2 dimmable, 35-watt halogen lights Cavaliere offers a complete stainless steel range hood collection. They blend superior components with the latest technologies to create range hoods that cater to your needs. Cavaliere has a special understanding of the kitchen environment, ergonomics, aesthetics, and integration within your home or workplace. They specialize in wall-mounted, island, or under cabinet range hoods that make a statement in your kitchen. 19-gauge stainless steel and tempered glass. Low noise double chamber motor (level: 25 dB to 56 dB). Telescopic chimney fits up to 9-ft. ceilings. Dishwasher-safe grease filters. 6-inch round duct vent. Dimensions: 36W x 20D x 36.25H inches. 1-year parts warranty.